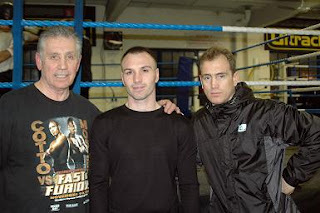 When Jimmy Tibbs says that former IBO Light Welterweight World Champion Colin Lynes, whose next fight is on Saturday 12th February 2011 at Olympia in Liverpool, could campaign for a second world crown, this time at Welterweight, only a boxing philistine could possibly doubt the man’s words. Jimmy has spent more than 50 years in boxing, he was a top-class amateur and professional boxer and has also been a manager and a promoter. However as a trainer Jimmy earned the reputation of being one of, if not, Britain's finest. Over the years Jimmy has prepared and guided such British Boxing luminaries as Nigel Benn, Chris Pyatt, Charlie Magri, Barry McGuigan, Steve Collins, Dennis Andries, Wayne Alexander, Lloyd Honeyghan, Alex Arthur and Frank Bruno to World Championship success, and many more to British, Commonwealth and European honours. Currently Jimmy is coaching, in addition to the aforementioned Colin Lynes, some of the brightest upcoming young British fighters such as the Mitchell brothers, Kevin and Vinny, former Olympian Billy Joe Saunders, Freddie Turner, Akaash Bhatia and Billy Morgan at the Ultrachem TKO Boxing Gym in Canning Town, London. It was following a sparring session between Colin and Michael Grant at the TKO gym that Jimmy spoke about the future prospects of the former Light Welterweight World Champion, “Colin Lynes is fighting on the 12th February. He’s been with us for about six months now. He’s the former British, European and IBO Light Welterweight World Champion. Because of weight problems he’s suffered a bit, so he’s decided to move up to Welterweight. We’ve had him moving about with some good Middleweights, Light Middleweights and he’s as strong as an Ox. Give him a couple of warm up fights and he’ll end up fighting for a Welterweight title, whether that’s the British title, Commonwealth title or European title, and he will win it because of the life he lives and the way he looks after himself. He’s always in condition, and that doesn’t mean to say that he’s training every day. He looks after his body when he’s not training, and that’s what a lot of youngsters should learn in this game today. They have one fight, two fights, they go away and come back rolypolys and all they’re doing is not training to get fight fit, they’re training to get the weight off. I’ve got a couple of fighters that should go to a clinic and see a doctor because they’re going to be in serious trouble in years to come. Whereas Colin Lynes is 33 years of age, he’s had 41 fights and he’s not got a mark on him. He’s got the rhythm of a twenty year old because he looks after his body in and out the ring. He’s got a spring in his step, he’s still got that, he makes people work, in and out, in and out all the time, he makes them move their body about. That’s because he looks after himself when he’s not boxing.